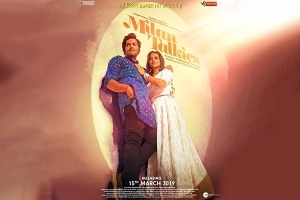 MILAN TALKIES is the story of two lovers in a small town. The year is 2010. In Allahabad, Anu Sharma (Ali Fazal) is a small town filmmaker and dreams of becoming a big shot director some day. He funds his films by selling exam papers. Maithili (Shraddha Sainath) approaches him one day as she needs help in passing her examination. It is the pre-requisite by her future in laws before she can tie the knot. Anu agrees and falls in love with her. In fact his racket gets exposed and yet he goes out of the way to help her cheat and pass in the exams. Maithili too begins to love him and they start a romantic relationship. They start to hang out in the projector room of the single screen theatre Milan Talkies since Anu is friends with the projector guy, Usman bhai (Sanjay Mishra). Anu wants to send his father (Tigmanshu Dhulia) to talk to Maithili’s father Janardhanan (Ashutosh Rana) for marriage. But Janardhanan is a priest and quite conservative. Hence he detests film industry and those working for it. As a result, he would never agree to the union of Anu and Maithili.